Take a deep dive into the relationship between the sons of the greatest superheroes ever known! 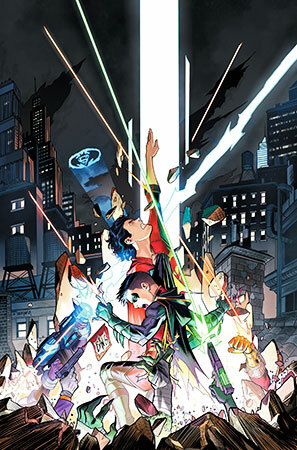 Superboy and Robin's relationship hasn't always been the easiest but as threats continue to appear they will dig deeper than they ever have before to form a team worthy of the name Super Sons. Acclaimed writer Peter J. Tomasi (Superman) and rising artist Carlo Barberi (Super Sons) take you into the past for an action-packed story starring the sons of Superman and Batman! Collecting issues #1-6.Take a deep dive into the relationship between the sons of the greatest superheroes ever known! Superboy and Robin's relationship hasn't always been the easiest but as threats continue to appear they will dig deeper than they ever have before to form a team worthy of the name Super Sons. Acclaimed writer Peter J. Tomasi (Superman) and rising artist Carlo Barberi (Super Sons) take you into the past for an action-packed story starring the sons of Superman and Batman! Collecting issues #1-6. Peter J. Tomasi is a New York Times best-selling author known for his current work on Superman and previous projects Batman & Robin, Superman/Wonder Woman, Batman-Detective Comics and Batman- Arkham Knight, along with other commercially successful books such as Green Lantern Corps, Brightest Day, Emerald Warriors and Nightwing. Over the course of his career with DC Comics--more than two decades of hit books--Peter served as a group editor, ushering in new eras for Batman, Green Lantern and the JSA along with special projects like Kingdom Come. Peter also is the author of the creator-owned books Light Brigade (Dark Horse) with artist Peter Snejbjerg, The Mighty (Dark Horse) with Keith Champagne and artists Peter Snejbjerg and Chris Samnee and the critically acclaimed horror/drama series House of Penance (Dark Horse) with artist Ian Bertram.